Search Results for "espresso maker"
Wide shot of a man putting a purafilter into an espresso maker and waiting to pull the shot. Placing a double walled espresso shot glass onto a stainless steel espresso machine, under a stainless steel porta-filter. 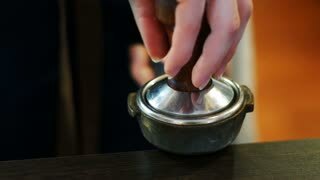 Making ground coffee with tamping fresh coffee. Professional barista. 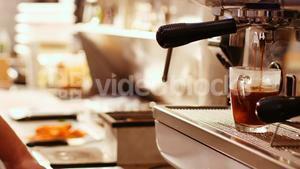 Barista hands steaming milk with a coffee machine. A professional Barista purring worm milk to a cappuccino cup. Pan of espresso machine brewing a shot of espresso into a double walled espresso glass on the kitchen counter. Installing porta-filter into a stainless steel espresso machine on the kitchen counter at home. Preparing the espresso maker for brewing. Placing stainless steel porta-filter into stainless steel espresso machine on the kitchen counter at home. Man preparing to brew espresso shots. Removing the stainless steel porta-filter from a stainless steel espresso machine on the kitchen counter at home. Placing porta-filter into stainless steel espresso machine on the kitchen counter at home.